In a previous post I discussed some initial thoughts around a potential relationship between the Registered Teacher Criteria and professional eportfolios. I mentioned teaching as inquiry in the post but not in any great detail about how it might work and look. So inspired by conversation, feedback and other people’s thinking let’s make that step by taking the Teaching as Inquiry framework, central to effective pedagogy as outlined in the NZC to underpin the process. By starting with teaching as inquiry (TaI) and using it as the foundation for professional appraisal and teacher registration, we are reinforcing the core focus of teaching (and therefore the appraisal & portfolio) to achieve improved outcomes for all students. 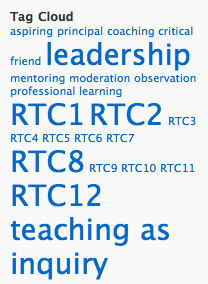 So I would want to use the RTC in a cyclic and ongong manner too… and reference it within a professional eportfolio. So what might that look like in practice when it is captured and shared within an eportfolio? You could take an approach similar to this Mahara/MyPortfolio template. While this approach is very functional and mirrors a traditional ‘filling out a document’ approach, its strength would be in the ability to provide feedback to the teacher within MyPortfolio but I have a lot of unanswered questions regarding its use. In a worse case scenario, this approach could just become something you complete when your rego is due or within the performance management process, you just share it with your appraiser when required. It doesn’t directly reinforce the benefits of TaI nor show an ongoing cycle of reflection and next steps. If I were in a postion to lead this in a school then I would favour a blog/journal approach rather than a page. Whether using WordPress, Blogger or the blogging capacity within MyPortfolio, the tool is not important rather the ability to tag (or label or categorise) your entries and display these tags as either a list or cloud. This then becomes your blog index allowing you to select the posts which relate to and provide evidence towards the appropriate registered teacher criteria. What is also really important to note that in this approach you don’t go out and write a post on “how I have achieved and reflected upon Criteria 4”. Instead your ongoing reflections, inquiry into practice, involvement in professional learning and development, mentoring, obvservations, staff meetings, teaching practice and so on, are blogged/reflected on as and when they happen, and any association with the criteria is noted. How does your school manage this/these process(es)? Silos? I am always or the look out for examples of professional teacher eportfolios, with reference to TaI and RTC or not. Do you have any to share?